In 1912, the Pi Beta Phi Fraternity for Women founded the Pi Beta Phi Settlement School in Gatlinburg, Tennessee as a service project to commemorate its 50th anniversary. 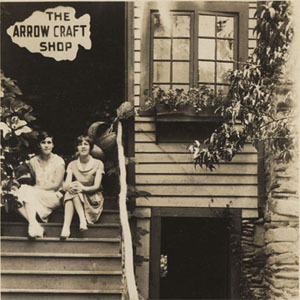 Thanks to a grant from the Institute of Museum and Library Services (IMLS), the University of Tennessee Libraries, along with the Arrowmont School of Arts and Crafts and the Pi Beta Phi Elementary School, Gatlinburg, Tennessee, have collaborated to create a fully-searchable digital collection of archival materials that document the history of the Settlement School and its contemporary legacy, Arrowmont. The digital collection features photographs of the Settlement School, early Arrowmont, and the surrounding community; an historical essay collection that relates the "Pi Beta Phi to Arrowmont" story; letters, diaries, and scrapbooks written and compiled by Settlement School teachers; images of contemporary art pieces housed at Arrowmont, including a 360-degree interactive gallery; and an integrated curriculum package for K-8 students developed at the current Pi Beta Phi Elementary School in Gatlinburg.